The Obama administration announced today the commutation of Chelsea Manning’s sentence for disclosing classified information that raised public awareness regarding the impact of war on innocent civilians. Manning will reportedly be freed in May 2017. “I’m relieved and thankful that the president is doing the right thing and commuting Chelsea Manning’s sentence,” said Chase Strangio, a staff attorney with the American Civil Liberties Union’s LGBT Project representing Manning. “Since she was first taken into custody, Chelsea has been subjected to long stretches of solitary confinement — including for attempting suicide — and has been denied access to medically necessary health care. This move could quite literally save Chelsea’s life, and we are all better off knowing that Chelsea Manning will walk out of prison a free woman, dedicated to making the world a better place and fighting for justice for so many.” Manning, a transgender woman, is in the seventh year of an unprecedented 35-year sentence and has been forced to serve her sentence in an all-male prison. The ACLU previously filed a friend-of-the-court brief in support of the appeal of Manning’s conviction, arguing that the prosecution of Manning under the Espionage Act violated the Constitution because it leads to prosecutions where a court gives no consideration to the public interest. The ACLU also argued that such cases give the government too much leeway to selectively prosecute disfavored speakers. 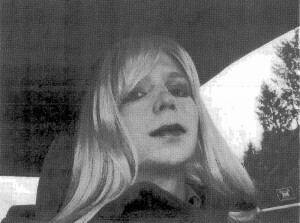 Obama springs gender celebrity Chelsea Manning from prison. If you are like me, you asked yourself one question yesterday. Who is Chelsea Manning and why can't I remember what heinous crimes she committed? So i did some research and bang, there it is. 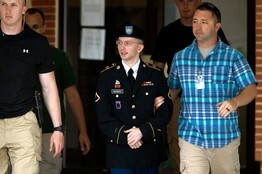 Bradley Manning from 2013. Manning now identifies as a woman, thus Chelsea Manning. A Wall Street Journal editorial headline, Politically Correct Clemency makes this situation understandable. In this article a clear summary of Mr. Manning's actions. For those who need reminding, Manning was stationed in Iraq as a low-level intelligence analyst when he gained access to troves of classified material. Starting in 2010 he leaked nearly 750,000 documents to Julian Assange’s WikiLeaks. Included in the material were thousands of secret State Department cables and masses of military information on the wars in Iraq and Afghanistan. Assange worked with reporters from several news organizations to publish the material, to much self-congratulation about the virtues of transparency. U.S. diplomats and military officers took a less charitable view, with good reason. While many of the State Department cables contained little more than diplomatic party gossip, others disclosed sensitive conversations between U.S. diplomats and opposition leaders in repressive regimes. After the disclosure, Zimbabwe’s Morgan Tsvangirai was investigated by the regime of Robert Mugabe for “treasonous collusion between local Zimbabweans and the aggressive international world,” as the country’s attorney general put it. Even more dangerous were leaks of operational secrets, including the names of Afghan informants working with U.S. coalition forces against the Taliban. A Navy SEAL who participated in the 2011 raid on Osama bin Laden’s compound in Pakistan testified that Manning’s leaks were found on the terrorist’s computer. Little wonder that at the time Mr. Obama criticized “the deplorable action by WikiLeaks.” Then-Secretary of State Hillary Clinton warned that the document dump “puts people’s lives in danger” and was “an attack on America’s foreign policy,” its partnerships and alliances. Prosecutors initially sought a life sentence against Manning, who was eventually convicted of 17 of 22 charges, including espionage and theft. Within 24 hours of sentencing in 2013, Manning said he wanted to begin hormone therapy and be known as Chelsea. Last year the Army agreed to finance her medical treatment for gender dysphoria. In December the ACLU and numerous LGBT groups wrote to Mr. Obama urging that he grant clemency to Manning, in part on grounds that she has been held in solitary confinement after suicide attempts. A few articles from 2013 regarding his trial. The commutation sends a dreadful message to others in the military who might have grievances or other problems but haven’t stolen national secrets. The lesson is that if you can claim gender dysphoria or some other politically correct condition, you can betray your country and get off lightly.